What It’s About: In ancient Egypt, Princess Ananka (Yvonne Furneaux), high priestess of the god Karnak, dies. Blinded by his forbidden love for her, Kharis (Christopher Lee), attempts to use the Scroll of Life to resurrect her, but he is caught and buried alive, sentenced to guard over her tomb in living death for eternity. In the Victorian era, Mehemet Bey (George Pastell) warns the Banning Expedition, led by Stephen Banning (Felix Aylmer) against entering the tomb, but Banning ignores him. When Stephen realizes he’s found the right tomb, he sends his brother-in-law Joseph Whemple (Raymond Huntley) to tell his son John (Peter Cushing) the news. When Whemple returns Stephen has lost his mind. Three years later, in England, Stephen regains coherence long enough to warn John that something is coming for them. Can John figure out the mystery behind Kharis in time to save his uncle and himself? Why Watch It Today? : King Tut’s burial chamber was unsealed today in 1923. Tales of the curse of the tomb eventually lead to Universal’s The Mummy and an entire new sub-genre of horror. In the 1950s Hammer Studios began a series of what would now be considered “re-imagining” of Universal’s classic movie monsters. In most cases that involved going back to either the source novels or folklore, but here Hammer simply takes the basic scenario of any given Universal Mummy movie and gives it the Hammer look, feel, and cast, resulting in a far better sequel to the original film than Universal ever made. This entry was posted in Cults, Horror, Movie of the Day, Mummy, Period Film, Remake and tagged Britain, Christopher Lee, cult, curse, Egypt, Hammer, Jimmy Sangster, Michael Carreras, Michael Ripper, Peter Cushing, priest, priestess, Terrence Fisher. Indeed. 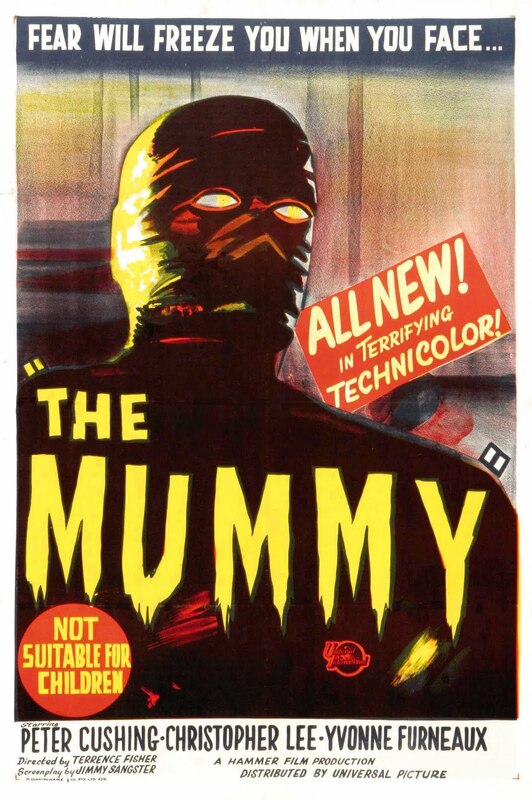 And thanks to its essential Hammer-ness (right down to Christopher Lee in the Mummy makeup) it’s my second-favorite Mummy film of all time. Karloff can’t be beat, but at least Hammer still cared about doing something with their concept that might actually horrify. More than can be said for Universal, who seem compelled to turn all their classic monsters into interchangeable Action villains.